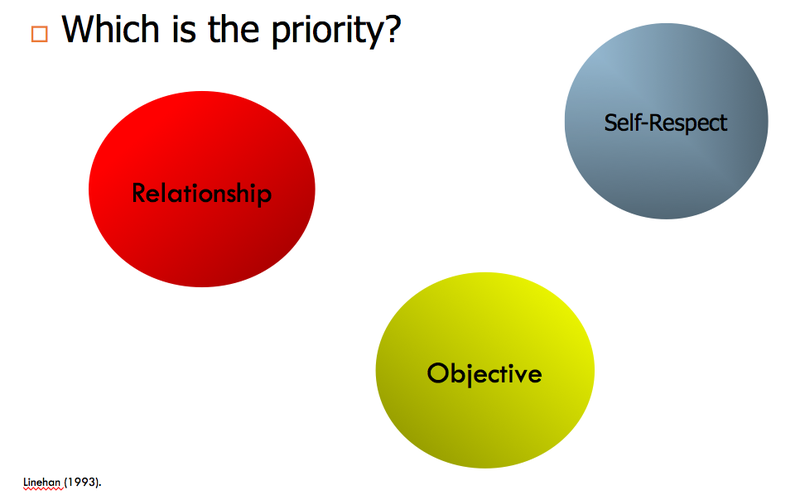 Interpersonal Skills Module: Priorities in Relationships (Reposted) - Welcome! This is a repost of the group topic revisited on 2/28/17 & 3/1/17: The following is a synopsis of a weekly Dialectical Behavior Therapy (DBT) group lesson, based on the work of Marsha Linehan out of the University of Washington. This week’s lesson is actually outside of the normal DBT content, it is solely based on the codependency literature, specifically the work of a wonderful fellowship called CODA. This week’s lesson was the first in reinforcing the main model of this module which is choosing priorities in conflict. This model is super helpful for guiding our decision making in response to a conflict. One of the main sticking points in handling conflict is that we often do not respond to the correct priority. Following this model helps us to handle difficult interpersonal situations correctly. So what IS a priority? A priority is a super important thing, something that we put above all or most other things. In any significant conflict, we are juggling 3 very important priorities: The trick is figuring out which one is just a little bit more important than the other two: Very often, we decide to handle a situation a certain way because it involves our parent, our spouse, or some other significant person, as if the relationship is the most important priority. Or sometimes, we decide to handle a situation a certain way because of pride or ego, as if our self-respect is the most important priority. Otherwise, we may decide to handle a situation the way we do because we are focused on getting what we want. Although these decisions may be right, we need to take a step back to determine which is the most important of these priorities in THIS SPECIFIC SITUATION, rather than responding to it based on the wrong priority. Relationship: This is the first priority when the conflict emerges from something we have done wrong, where maybe we hurt the other person, or treated them in a way that goes against our own values. For example, if you forgot to pick up your friend from the airport and made her wait 2 hours longer than needed, you should probably respond in a way that puts the relationship first, before the goal of explaining why you forgot, and before defending yourself or focusing on your needs. When the focus is on getting or keeping the relationship intact, this is our main priority, more than some goal or our self respect. Self Respect: This is the first priority when the conflict emerges from someone disrespecting us, intentionally or not. An example of this may be when a close friend starts jokingly making fun of you in a group of people, taking it too far and hurting your feelings by telling people some things that were private and between the two of you. When someone does not treat us with the dignity or respect that we deserve, then self respect becomes more important than achieving some goal or keeping the relationship intact. Objective: This is the last of the 3 priorities, and it becomes the most important priority when the conflict emerges from our asking for something we want, saying no to a request, or having to obtain our legitimate rights. An example of this might be when you approach your boss for a raise, and you know that he is going to be angry with you for asking. The relationship is important, and so is your self respect, but the goal of trying to get the raise is just a little bit more important than those other priorities. A good way to remember this is that this is the most important priority when the relationship isn’t being threatened, and our self respect isn’t being attacked. In these cases, the goal is probably the most important thing. We spent our group tonight going over several examples of common difficult situations, and thinking through what would be our first, second, and third most important priorities in those situations. We will be using many more examples in the next few weeks, coupling the specific skills that go with each priority. Applying this model to specific examples that come up in our life really help this model become more automatic, and we can more easily choose the correct response without much thought, over time.